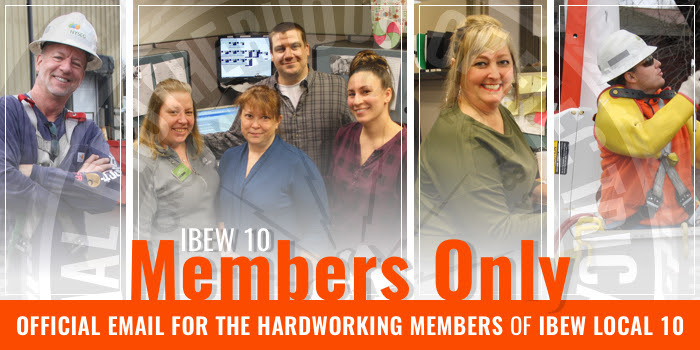 You can now keep in touch with IBEW Local 10 on Facebook and Twitter. Like us on Facebook and you can stay up to date with all of the news from the IBEW, Local 10 and other relevant news that affects our union on Twitter. If you have lost or never received an IBEW Member Card, please send your name and address to the Local 10 IBEW office IBEWLocal10@stny.twcbc.com or mail it to: Local 10 IBEW271 Main StreetJohnson City, NY 13790 ...and we will forward it to the International. IBEW Local 10 has ratified the contract with NYSEG (Iberdrola USA). The vote was passed by over 60% of the membership.